Mokuyokai invites you to join us and JET Alumni Association of BC (JETAABC) for 5toSurvive Run on Sunday, April 10th at 10 am! 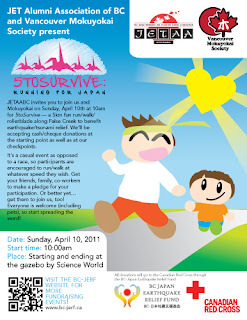 This is a 5km fun run/walk/rollerblade along False Creek to benefit earthquake/tsunami relief. We will be collecting cash/cheque donations at the starting point as well as at checkpoints. The event is open to all fitness levels and age groups, participants are encouraged to run or walk at their own pace. Invite your friends, family, and co-workers to make a pledge for your participation, or, invite them to join us. Everyone (including pets) is welcome! receipt (see us at the meeting point for details)! What is 5toSurvive? It started off as an idea by JET (Japan Exchange and Teaching) Programme participants in Japan to raise money for earthquake/tsunami relief by running or walking 5 km. This simple 'idea' has spread across various JET Chapters across Japan, the UK, the United States, and now…Canada. Volunteers: We are looking for 6-8 volunteers for this event to help at the checkpoints and with general set-up/tear-down duties. Please email Emily Wu volunteer[at]mokuyokai.bc.ca (at=@) if you are interested! *Note: there will be a mandatory meeting for checkpoint volunteers on Saturday, April 9th @ 1pm.